Where Does God Hang Out? Ever wondered where God hangs out? Now I know that God is everywhere, but what I’m trying to get at is where does the Divine hang out with us. Where do we really experience the intimacy of the One who fills all in all. When we observe those who believe in a Divinity, it would appear that for many it’s a sacred building wherein lies the Reality of Transcendence. For each Friday, Saturday, or Sunday, millions worldwide head to their local, Mosque, Synagogue or Church in their search for God. An alien observing our religious practices would have to conclude that the Source has instructed It’s followers to meet up with It in the dedicated structures of ‘holy’ buildings. I once remember sitting at the back of St. Mary’s Basilica, in the historic city of Krakow, Poland, with my eyes focused on the isle in front of me. A recovering Protestant like me couldn’t believe my eyes. For on a regular weekday morning, a steady stream of teenagers would walk into the cathedral and immediately drop to their knees, making the sign of the cross as they devotedly stared at the altar. Back in Northern Ireland it was a Herculean task to drag a hormone tossed teenager into a church on a Sunday morning outing! Of course, Poland is still a Catholic fuelled nation, one whose identity is closely tied in with its faith of choice. Nevertheless, it was the perception of the young folk concerned that God somehow hung out here more than anywhere else that slightly disturbed me. The danger for all religions is that a place and its related rituals, be it group prayer, worship via song, sacramental acts of remembrance or the sermon-homile become the only place for Divine contact in the eyes of their adherents. More worryingly is the underlying programming that one must attend and support the associated institution in order to keep in touch with the Divine. Holy texts, tradition and guilt are all used to keep the faithful on the hamster-wheel of religious attendance. Unsurprisingly the Divine may touch the hungry soul in such an environment. If the individual in question only looks for Divine Love in their hallowed environment of choice then that is where It will manifest from time to time. An act of mercy, rather than the outcome expected for putting the attendance penny in the slot of the religious fruit machine. Many of my old Christian friends often look at me with saddened eyes before asking if I don’t miss the regular meeting together of the saints on a Sunday morning or Wednesday evening in my church of choice. My answer tends to shock them a little; it’s always an emphatic but hopefully humble no. I’m afraid I’ve attended too many Christian circuses in my time to appreciate the spiritual nuances of being in a sacred building doing my sacred stuff. I have to be honest; churches tend to give me the creeps. Here in Lincoln, we have one of the most striking Gothic Cathedrals in the world. Tourists come by the coach-load to pay their £8 and see the ecclesiastical wonder that meets them. Yet, it does nothing for me, failing to touch any sense of the Transcendence within. Lincolnshire, being a very rural county is peppered with endless little Anglican parish churches, striving to survive the ravages of time. Occasionally I will go in to have a wee peep. Again nothing but the ghosts of times long gone, war memorials to the fallen brave of our past military misadventures. Not a spark of the eternal grabs my open heart. Of course many folk find solace and meaning in their shrine of choice. For many ritual is faith and faith ritual. Yet, I’m afraid, no longer for me. I’ve left behind the past scenes of my holy encounters, the waving arms, the rock fuelled worship, the teaching times of human wisdom. Yet, let me make clear that I’m not here to judge my fellow travellers, only to point towards another way for those tired of their building devotion. So where is this place where I and Spirit touch. If not in the purpose-built sanctuaries of man then where? Well, let me answer with a simple little illustration. This morning as I left my local paper shop to jump into my car I had an encounter. An encounter with Other, via the most touching of forms. 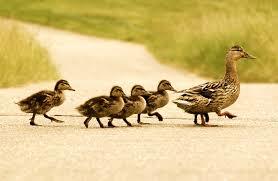 Suddenly I spotted a mother duck crossing the road in front of me. Walking with great confidence and assurance she was followed by her three, little, fluffy ducklings, eyes devotedly fixed on their mama in front. ‘There’s mimesis for you my son,’ whispered my inner Voice. The idea that God dwells in “a temple made with hands” has never died. It’s an ageless delusion that most believers still accept as reality. The mantra among the faithful is, “not forsaking the assembling of ourselves together…” putting the guilt trip on those who know God apart from the religious bells and whistles and trappings. I like the quote by the writer Alice Walker: “Any God I ever found in church, I brought in myself.” Of course the hierarchy would have us believe that we go to church to find God through them, not to share the treasures we hold in these earthen vessels. He speaks anywhere, anytime, 24:7. Waking or sleeping he speaks (or sings or dances) directly to us, for it is through us that he lives and moves and has his being. Excellent article and wonderful responses. I too am a strong believer in the “in-dwelling God” and hope that those who seek the divinity of God and her/his self will find that God IS ‘themselves’.